Looking for Kids Craft Ideas? 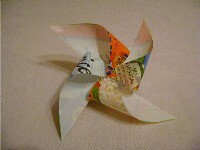 kids craft ideas, using recycled materials, are great if you want to save some money on expensive craft materials. 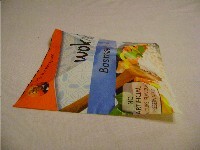 You are also helping to reduce landfill buy not throwing plastic in the bin and not buying newly made craft kits. Keeping the kids busy couldn't be easier! It uses nothing but used materials that most of us have lying around the house. First thing you need is something to make the piece of the windmill that turns at the top. 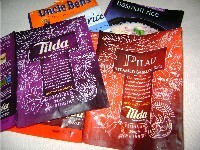 I use plastic microwave rice pouches as the plastic is not too heavy but thick enough to keep it's shape. You can try anything that you have lying around and even paper will work. Plastic is weather proof though so you will be able to leave your windmills in the garden. 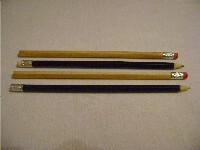 Two pencils with erasers on the end. 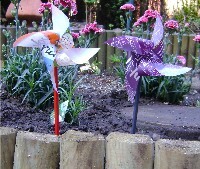 You need these for the stick so you can hold the windmill or plant it in the garden. Pencils are very useful for kids craft ideas and we all seem to have lots even if we never remember buying them! A pin with a bobble on the end. This makes the best shaft for the windmill to spin on. 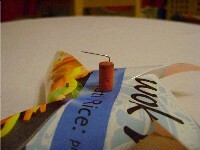 If you can't find one a drawing pin can be used with a slight variation, but a pin is definitely better. 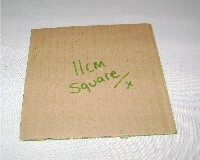 A piece of cardboard cut into an 11cm square. If you don't have cardboard a piece of paper will do it's just not as sturdy for little hands. 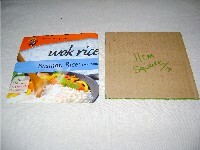 Place the square of cardboard onto an empty and cleaned out rice packet. Draw around it with a felt tip. Cut out the square where you have drawn. Fold the square of plastic in half diagonally and open out. Do the same for the other diagonal and again open back out. 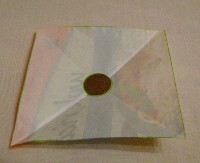 Take a penny and place it in the middle of your piece of plastic. Draw around it with a felt tip. Cut along the folds you made and stop when you get to the circle you have just drawn. Do this for all four folds. Get ready with your pin! Take a corner and bend it in to the middle, hold it there with your finger. Continuing around in a circle, miss one corner out then bend the next one in. Carry on until you are holding all four corners in the middle. Stick the pin through all the layers in the middle so it goes right through and comes out the back. Small children may need assistance with this bit as it's tricky to hold it all in place. 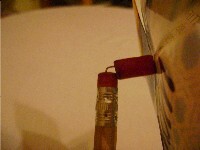 Take one of your pencils and remove the eraser from the end. 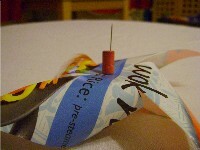 Very carefully stick this on the end of the pin thats sticking out the back of your windmill. 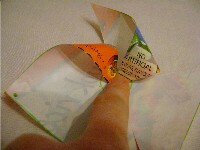 Leave a tiny gap between the plastic and the eraser so that your windmill will spin freely. Very carefully bend the pin over where it comes out of the eraser. Don't bend it anymore than 90 degrees or your windmill will catch on the stick! Ok this kids craft idea is nearly finished! 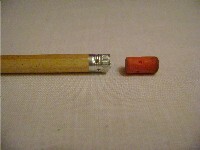 All thats left to do is get your other pencil and stick the pin into the eraser at the top. That's it! I hope you enjoyed this kids craft idea. A great way to recycle plastic and costs nothing!